In class today we were reading parts of Seneca’s Medea, and the prof started talking about decedents of the sun. And none of us could remember Phaëton’s name. I was severely disappointed in myself, and decided I needed to brush up on my knowledge of obscure names from mythology. Which led me to thinking that you all need to brush up on your knowledge of Greek mythology! Which undoubtedly led me to a promise to myself to post something mythology related once a week. Phaëton is the son of Helios¹, the god of the sun, and Clymene. In Ovid, Phaëton likes to brag about this, and is taunted by Epaphus, son of Zeus and Io. Phaëton begs his mother to give him “some token that that parentage was true.”² Eventually, Clymene tells him how to get to the place where Helios begins his journey each day.³ When he arrives, Helios confirms that he’s Phaëton’s father, and swears on the river Styx⁴ that he will give him anything he wants to prove this is the truth. Phaëton decides that he wishes to ride his father’s chariot. 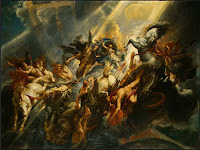 Helios protests that only he, not even Zeus himself, can control the horses, and Phaëton is a mere mortal. But his is bound by his oath and cannot disuade his son. Needless to say, as he mounts the chariot and attempts to drive off, he is in over his head. “Phaëton, dazed with fear, could neither use the reins nor find the road, nor were it found could make the team obey.”⁵ He ends up losing control and flying so close to the earth that he sets it on fire. Zeus, then, is forced to knock him out of the chariot, and to his death, with a lightning bolt. There is a tradition with the sun causing great catastrophe in Greek mythology. Phaëton. Icarus. Clytie. The sun, it seems, is this great untainable power. And those who are foolish and arrogant enough to try to reach that high, inevitably fall as far. ¹ Also known as Phoebus, often associated with Apollo. Apollo Phoebus is Apollo of the sun, thus making Helios sort of obsolete. The Greek gods often fail to have definitive roles. ² Ovid, Metamorphoses, Book I. ³ India. It’s the eastern most part of the known world during that time. ⁴ The only oath that can bind a God. Well there is my fun useless fact for the day… Thanks Feather.